Happy Friday! I hope everyone had a good week. We had our first snowfall of the season at the beginning of the week and that just made my entire week worth it, even if it didnt stick around long. It was a reminder that winter in Alaska is almost here, wooohooo! 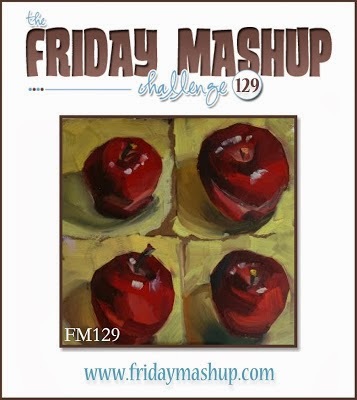 However, our Friday Mashup challenge this week is brought to us by Erica and keeps us firmly planted in autumn with a gorgeous color combo and fruit images! For my card I went with one of my favorite scenes, this stamp of pumpkins in a field. When we lived back east we used to grow our own pumpkins, plus we would take the kids out every year to the pumpkin fields to pick some there. We decorate pretty big for Halloween and while living back east we would have between 40-50 pumpkins in our display, so we needed a lot :) I watercolored the pumpkins with Cherry Cobbler and So Saffron to get an orange-ish colors. 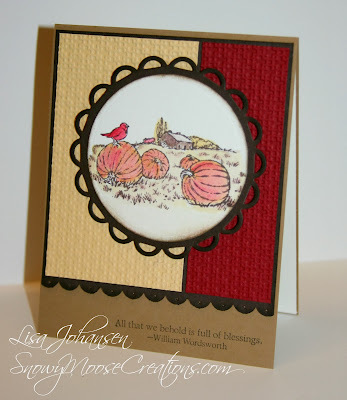 I also used the great sketch over at The Paper Players for this card, I love this sketch! Create a project with using the colors "Cherry Cobbler, So Saffron & Early Espresso." Create a project using a "Fruit Image." Or Mash it Up and create a project using the above "Color Combo & a Fruit Image. " This is lovely, Lisa! Great colors and I love the image and sentiment. 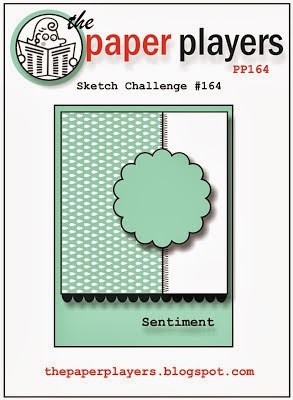 Thanks for playing along with my sketch challenge this week at The Paper Players! Beautiful coloring job, Lisa! Love your color blocked panels--they really set off the image nicely. So glad you joined us at The Paper Players! Great colouring and texture, Lisa. Love that stamp set! Love the scene, Lisa. But is a pumpkin a fruit? :) Wow, I can't believe you would display 40-50 pumpkins! Janneke and I just bought a couple for the front stoop... more to come. It is still warm here, so we can't put them out too early.